This issue is typically only observed when running SSB phone. You've got everything set up just the way you like it, amp or external power meter reporting 1500W peaks, and then you turn on PureSignal and all of a sudden you are seeing only 1300W peaks. Heck, you might have a fancy LP-100 peak power meter and even it reports a power drop when in peak power mode, although perhaps not quite as much. So what could the problem be? The answer is: there is no problem, but you do need to operate the radio a bit differently to achieve the same average power. First, referring to the illustration below, assume that 90% of your audio results in being between the minimum and maximum marks on the input power (horizontal) scale. 1. You are most probably running your amp up into a bit of compression. Compression is a state of gain nonlinearity whereby your input power may be varying by a lot, but the output power of the amp is not, simply because it cannot deliver the rated gain at those power levels. This is the red part of the amplifier gain response curve shown in the figure. When you are operating in the red part of the curve the amplifier gain response is nonlinear, and the term of art is "in compression" (and where the red line becomes horizontal this is known as being in "saturation"). Operating in the red part of the curve can generate quite a bit of intermodulation distortion (IMD) which shows up as harmonic and other spurious outputs both inside and outside of the desired transmit passband. Or, to use an amateur radio term of art, "splatter". 3. With PureSignal turned off the amplifier response will remain nonlinear and your average power will be at approx. the dotted line in the red area of the graph. 4. 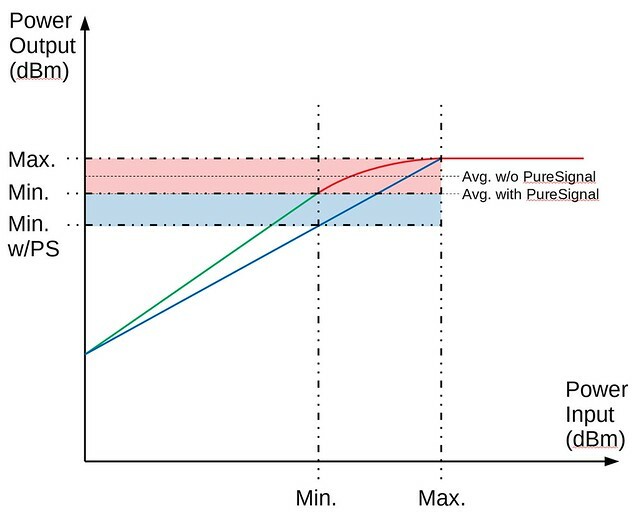 When PureSignal is turned on, it will predistort the audio signal in order to achieve an effectively linear amplifier response shown by the blue line. This line is nearly perfectly straight (linear) and thus IMD, its unwanted products, and "splatter" are greatly reduced. 5. 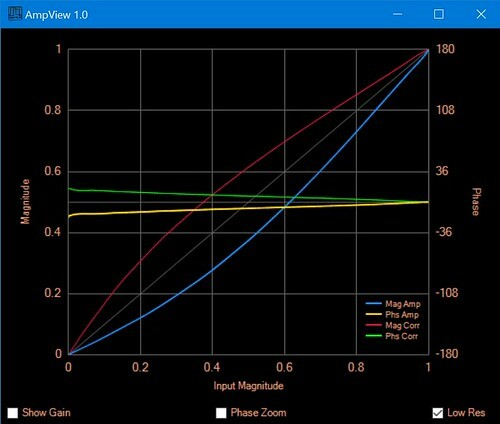 However, without changing any of your audio settings, you can easily see that the RF output power range has now increased to include the blue area, and that therefore the average RF output power has decreased somewhat. 6. MOST IMPORTANT: the PEAK power achieved by the amp has NOT decreased. It remains at the "Max." marks. You are still getting full value for your amplifier dollar , it's just that you can't tell because you don't have a peak reading RF power meter. Given that there are currently no RF power meters marketed to hams that actually provide a true, correct peak power reading, the easiest way to prove this to yourself is to use an oscilloscope to monitor the RF output of the station. a) If you don't operate in the nonlinear range of the amplifier gain response curve then you will not see this behavior, i.e. keep things in the green part of the curve where it is linear (see the above figure). But of course few people want to do this because then they are usually not obtaining the rated power of their amplifier. However, if you are lucky enough to have an amplifier that is capable of more than the legal limit then you can probably achieve this (and probably should be limiting it to that ). d) MOST IMPORTANT: everyone wants to be "loud", i.e. everyone wants a small peak-to-average-power ratio (PAPR). The old fashioned way of doing this was to run your amp into heavy compression (and be a splatter monster). With PureSignal you literally cannot do this, it will fight you tooth and nail and win every time. The correct way to do this is not to compress your RF signal, but to compress your audio signal. Luckily, PowerSDR includes the best audio processing features available in any ham radio, bar none. Use the leveler and the CFC compressor, avoid the "old fashioned" COMP compressor. See here for more information on how to set up your audio properly. Done right you can be as "loud" as you like and do it in a completely clean, razor sharp, splatter free way. This is why a properly set up Apache radio with PowerSDR mRX PS is the best sounding radio available.